In the very early universe, after things had enough time to expand and cool off, we know that the primordial matter must have formed into hydrogen and helium atoms. However, when we look around us today, most of the gas we see in between stars and galaxies is an ionized plasma, not neutral atoms. At some point between the early formation of atoms and the appearance of the stars and galaxies we see today, something must have supplied enough energy to those neutral atoms to strip them of their electrons and create the current interstellar medium. We say the universe was reionized. Exactly what reionized the universe, when, and how, is currently a very active subject of research. The truth is we don’t quite know what must have reionized the early universe, but we think it was probably the first generation of stars and galaxies. If we can find galaxies in that period of reionization, we will be able to learn much about this mysterious process. Remember that thanks to special relativity, when we observe an object very far away from us, we are actually seeing it as it appeared back in time, since its light takes time to reach us. At some point, if we look far enough away, the galaxies we see will be in the process of reionizing the universe. This is exactly what this paper is about: investigating a Lyman-break galaxy with spectroscopy from the Hubble Space Telescope and the Keck Observatory to see if it’s actually far enough away to be in the epoch of reionization. The very basic picture is that neutral hydrogen is good at absorbing light. If a galaxy is surrounded by a lot of neutral hydrogen, then any light it emits with a wavelength shorter (bluer) than the Lyman limit will mostly be absorbed by the hydrogen. The amount of this absorption tells us about the amount of neutral hydrogen the light is shining through before it reaches our telescopes, and we can see that objects far enough away have all of their bluer light absorbed by neutral hydrogen. This has allowed us to zero in on the time when the universe was still full of neutral hydrogen, and by extension, the galaxies that must be in the act of ionizing it. We currently think that this happened somewhere beyond redshift 6 or 7. This also gives us a nice means for detecting galaxies at far distances: roughly speaking, we can look for galaxies that are visible at redder wavelengths, but not visible at bluer wavelengths. This is nice, because we can search for many galaxies over large parts of the sky, just by observing a patch of the sky with two different imaging filters. The galaxies we find with this method are called “Lyman-break galaxies.” This technique can find a lot of potentially very distant galaxies, but in order to be sure of their distance we need to follow up with slower, and more precise, spectroscopy to verify their redshifts. Pictures of the galaxy in question in four different wavelength bands; you can see how the galaxy is clearly only visible in the reddest filter (rightmost). From Figure 1 in the text. 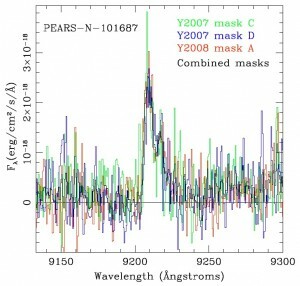 The authors started with the data from the GOODS survey, which combines very deep observations of a single patch of the sky from some of the best telescopes in the world. From this, they could identify some Lyman-break galaxies, which they then double-checked with data from the PEARS survey, which used one of Hubble’s spectrometers (the ACS grism) to observe the same part of the sky. 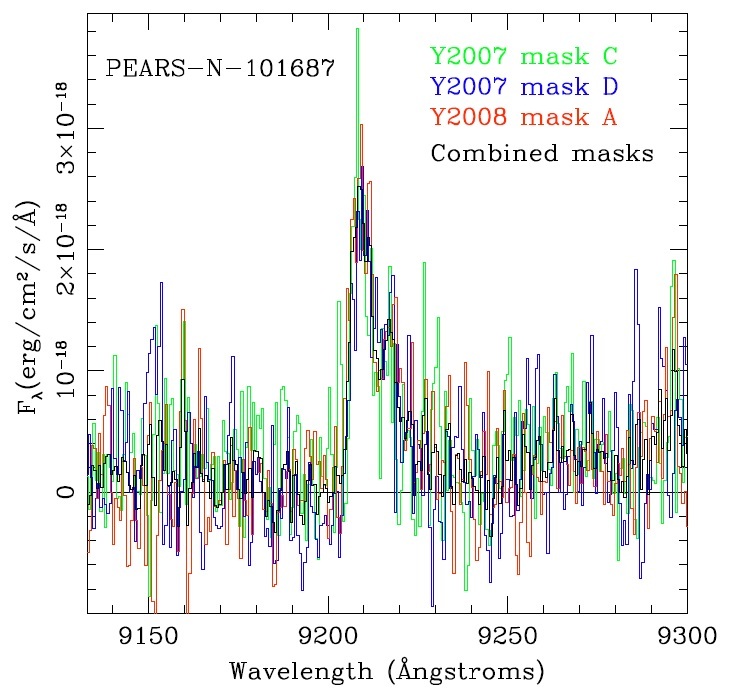 One of these galaxies, PEARS-N-101687, seemed to be at such a high redshift that it was just at the edge of the spectrometer’s sensitivity. 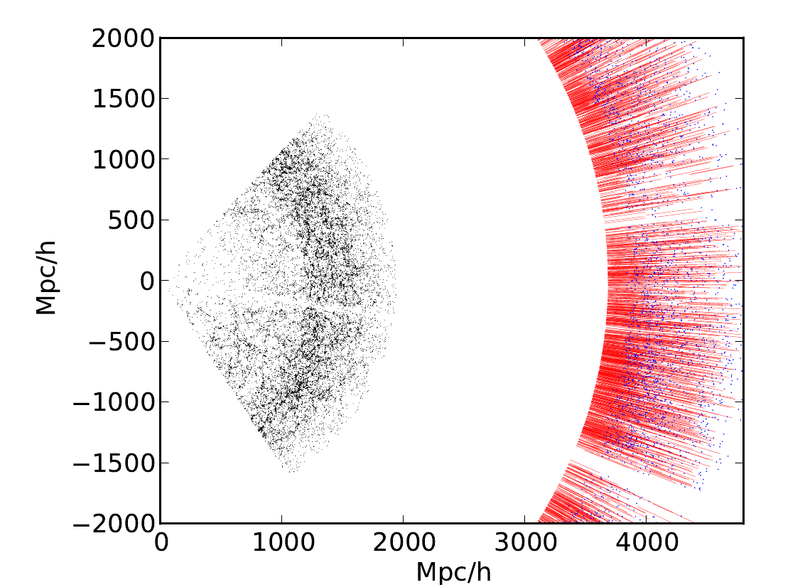 The spectrum of the galaxy, as it was seen by the ACS grism spectrometer. At the far right of the spectrum (the red side) we see the light of the galaxy, which abruptly falls off to the left (at bluer wavelengths), indicating absorption by neutral hydrogen. From Figure 2 in the text. This is indeed right at the tail end of when we think reionization must have been completed. 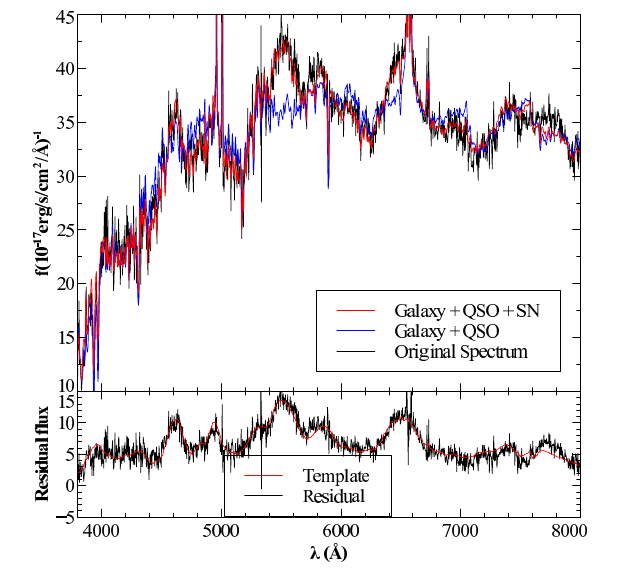 This isn’t the first such galaxy we’ve detected, but it’s notable for pushing the limit of ACS grism spectroscopy. Reliably identifying galaxies in the reionization epoch is extremely important for understanding the early universe, the formation of the first stars, and the growth of galaxies, but the actual spectroscopic verification of these galaxies remains difficult and time-consuming. 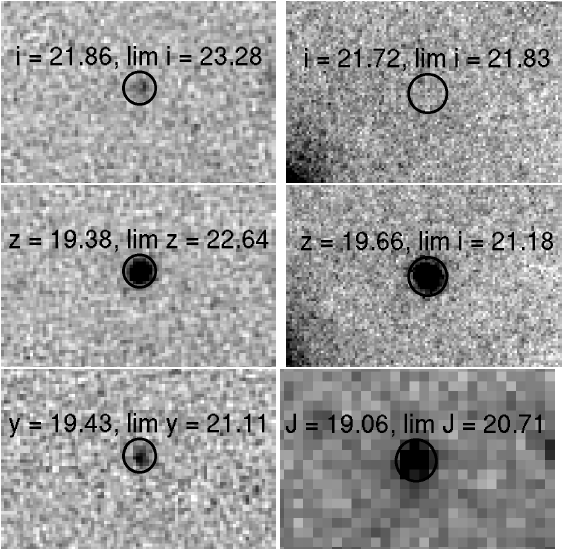 This paper illustrates one way of getting a handle on these elusive galaxies. The higher-resolution spectrum from Keck. From this, we can clearly see an emission line which allows us to determine the redshift of the galaxy. From Figure 3 in the text.